A beautifully decorated table and chair ensemble is one thing that is common at banquets, party halls, casinos, wedding feasts, festivities, business meetings and any other big-ticket events. Choosing the right kind of chair caps that goes perfectly well with the table linens enhances the look of the entire furniture ensemble. 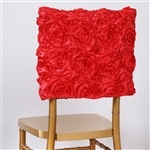 The rose print of the Grandiose Rosette Chair Caps is accentuated beautifully by the colorful linen and is sure to uplift the mood of the occasion. The three virtues of victory, desire and pride characterizes the stylish Rose print chair caps. The contemporary designed chair caps are also available in a wide variety of color. 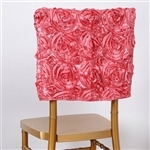 So, choosing your favorite Grandiose Rosette Chair Caps that matches your event will be easier.